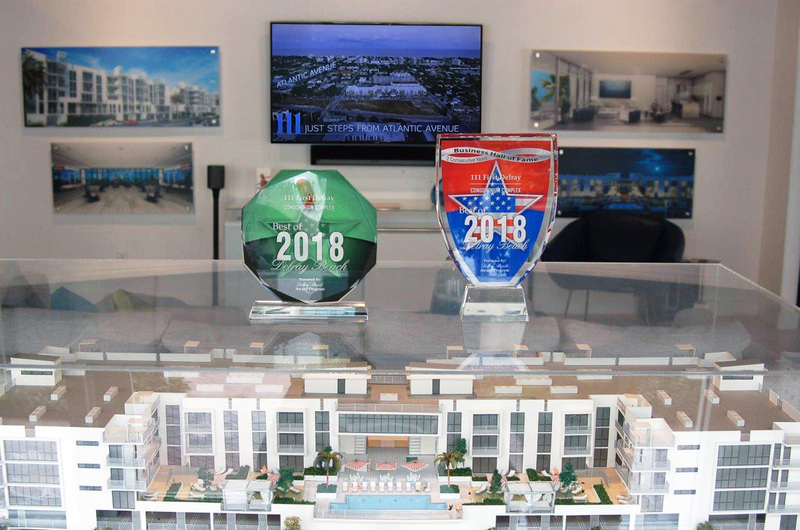 The results are in on the 2018 Best of Delray Beach Awards, and 111 First Delray has been officially named the city’s “Best Condominium Complex” for the second year running. The Best of Delray Beach Awards are given each year to local companies in all areas of business. Currently rising on SE First Avenue, just south of Atlantic, 111 First Delray is the first new, luxury condominium in Downtown Delray Beach in over a decade. With 70 spacious residences in the heart of SofA – the dynamic South of Atlantic district – 111 First Delray has been conceived from the ground up as the ultimate address for those who love Delray as much for its lively, downtown vibe, as for its flawless weather and beaches. In the year that has passed since winning the 2017 award, 111 First Delray has gone from being a beautiful concept with an ideal location, to becoming a tangible presence in the neighborhood close to topping off. Offering one-, two- and three-bedroom floor plans, 111 First can accommodate nearly any buyer’s needs. All residences feature luxurious appointments including Bosch appliances, wood-look porcelain plank flooring, quartz countertops, modern technology and more. Additionally, buyers can select premium interior design packages from design partner, Sklar Furnishings. Luxurious resort-style amenities range from the residents-only pool deck and covered, open-air lounge, to the top-floor, state-of-the-art fitness center with floor-to-ceiling windows overlooking the pool. With pricing starting from the $500,000s, 111 First Delray is not only the Best of Delray Beach, but the best value around. For more information about 111 First Delray and Sofa Partners, the developer of the project, please contact us here.